This project is really easy to make and will keep all your ribbons in order. Our template can hold 8 reels of Dovecraft ribbon but you can customise it to fit more or less. 1.Download and cut out the shape of your ribbon box template, if you are going to make a few we suggest using thick card for the template. 2.Trace the template onto the white card and cut out. Use your punch to make 8 holes where shown. 3.Use a bone folder to score the edges of the box, this will ensure a nice straight edge. 4.Cover the box with patterned paper, for the front section, use the template to make sure the holes line up then trim the rectangle to ensure it fits the box. 5.Glue the box together and decorate with your choice of embellishments. Now you can add your favourite ribbons and enjoy, these would make great gifts for your crafty friends. 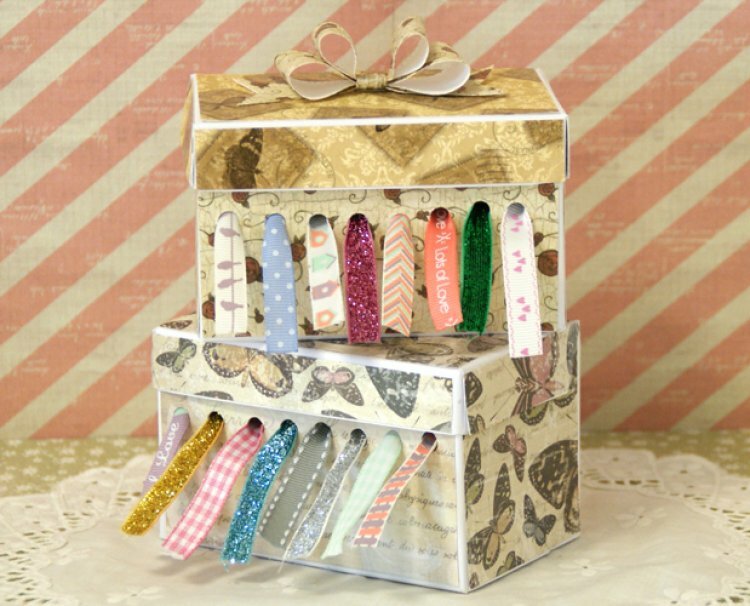 We would love to see your versions of the ribbon storage box in our project gallery.